Hayes & Yeading United succumbed to a late surge from Salisbury City who claimed all three points at the Raymond McEnhill Stadium on Tuesday evening. A fairly mundane game played on a bumpy pitch took a long time to spark into life and when it did, Salisbury made their superiority show. United manager Garry Haylock had a set back with the late withdrawal of James Mulley who picked up an injury whilst warming up for the match. Youth team captain Nathan Webb taking his place in the starting line up. 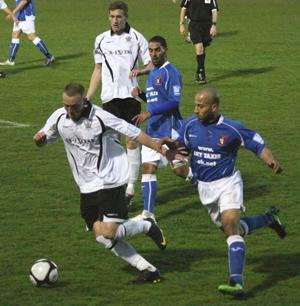 Matt Tubbs had Salisbury’s first chance when he was picked out by former United defender Ronnie Bull but he shot on the turn straight at Clark Masters. Tubbs turned provider for the next opportunity as his cross was headed up into the air by Danny Allen-Page and although Bradley Gray got to the loose ball first, his header was way off target. The most clear cut opportunity of the first half came in the 33rd minute. 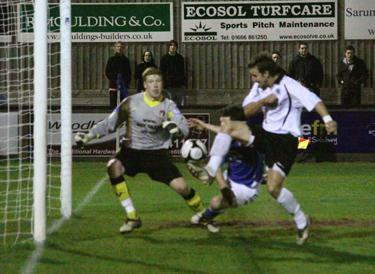 After Aaron Martin’s long ball had put Gray through on goal, the forward lobbed Masters, but Tom Cadmore was able to head the ball clear of danger. However, from Sean Clohessy’s corner, Gray met the ball firmly with a header which Masters did well to hold on to. The second half was even more bereft of goal scoring opportunities than the first until a masterstroke substitution from Salisbury manager Tommy Widdrington, who introduced midfielder Chris Flood. After Tubbs hit a free kick which deflected off Adam Green kindly for Masters to gather, Flood’s first contribution was to orchestrate the move which led to the first goal. His pinpoint long pass was headed back across goal by Ben Adelsbury and Tubbs was available for a tap in at the far post despite Masters’s efforts almost being good enough to keep it out (pictured right). The United keeper went close to gifting Tubbs a second soon afterwards with a horrific lack of communication. He rolled the ball out to Cadmore who wasn’t aware of what his goalkeeper was doing and Tubbs collected the ball and curled a shot inches wide. United’s substitute, youth team top scorer Daniel Wishart was also having a positive impact on the game and he got his team’s first shot on target when he collected Danny Allen-Page’s throw in, turned his marker and shot from just outside the area. However, James Bittner in the City goal was equal to it. United were enjoying their best spell of the game when a break away engineered by Flood was to deal a crucial blow. His long pass was perfectly weighted for fellow substitute Jake Reid to run onto and the forward showed impressive pace to run clear of the United defence. He rounded Masters and finished from an acute angle. 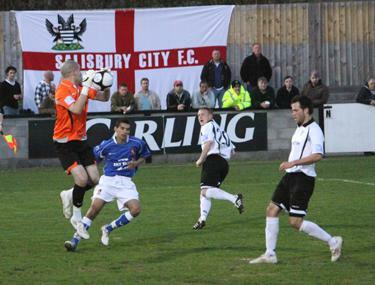 Salisbury got a third when Clohessy found Chris Shephard arriving in the box and his shot deflected off Cadmore and spun beyond Masters into the bottom corner. United got a consolation goal when Allen-Page’s low cross brought about quite a goalmouth scramble and when the ball broke out to Dale Binns, he prodded the ball through a crowd of players and Marwa got the final touch to help it over the line before a clearance was possible.